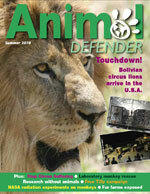 Welcome to the Animal Defender USA Magazine, Summer 2010. We have selected our key articles for you to read, just click on the links below. These four lucky lions have been on the journey of their lives – one which has taken them from a small cage on the back of a truck, being forced to perform demeaning tricks, to an expansive natural enclosure surrounded by stunning hillsides. Decisions by NASA and the Russian space agency to perform experiments on monkeys as part of plans for manned missions to Mars have brought a global response from ADI. In an exclusive interview with ADI, April Evans explains why she gave up a dream career at NASA in order to oppose the monkey experiments. The battle to rescue Benny, a 20 year old elephant sold to Circus Vasquez in the U.S. and transported illegally to Mexico, continues. The state of California has upheld a new ban on importing live frogs and turtles for use as food, despite pressure from vested interests and state legislators.